When you started blogging, it was pretty liberating, wasn’t it? Finally, a format for expressing your ideas! No barriers of time or distance to an audience. And once you started mixing words with other bloggers (and eventually meeting those people at conferences and tweetups), the energy continued to flow. Until you became a blog slave. Blogging can be a delightful tyranny. As you build an audience, as you see more incoming links, as you check Technorati rankings or see your name for the first time on the Ad Age Power 7,545 list of marketing blogs (OK, they say 150, but it doesn’t seem to stop there…), you begin to feel the pressure. You don’t want to lose your standing. Your momentum. Your ranking. As they say in academia, publish or perish. Dump that emotional ballast overboard as fast as you can, OK? Because you are not the sum total of your ability to produce. Your value is you, not your writing output. As well, I know social media is quid pro quo and while I try my best to keep up with other blogs (reading and commenting), comments on my blog, etc. I am falling WAY short and for that I am terribly sorry. I would completely understand if people stopped commenting/tweeting my stuff. Well, the fact is, other things really are more important than obeying Master Blog (as Beth discusses in her post), and Beth’s value to me is not tied to her “production.” She is a friend. She has nothing to prove. Her blogging production couldn’t possibly be top-notch anyway if she’s doing it out of a wearied sense of duty. Treadmills aren’t usually where we get into a creative zone. Beth doesn’t strike me as the type who wants to live like that. She’s a community-builder. And I would like to hope that putting my keyboard aside for a time would not cause the wonderful people in my network to drift away or be less than the great people I know they are. Otherwise, I’ve failed to build and be part of a community. Or I’ve associated with a bunch of artful fakes! (which I don’t believe for a nanosecond). If you’re strictly building an “audience” for your “production,” then it will be hard to avoid the slavery. Blogging will be a chore. At times, yes, all the creative and interaction work can be a bit of a slog now and again. 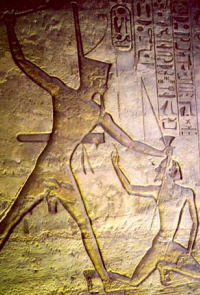 But let’s never become slaves, trying to produce bricks without straw, and expect that of others. That’s when I quit for good! In less than 2 weeks, one of my sons begins boot camp with the Marines. Let me say right off that I’m as proud as I can be of him. He’s joining for the right reasons; it’s been his decision all along and it was not made lightly. Gladly, and with a full heart, we let him go, into the service of his and our country. Did I mention that my wife and I are immensely proud of him? Oh, yeah, I did. Eighteen years ago he was learning to walk. Now he’s going to take on one of the toughest challenges anyone willingly shoulders. Becoming a U.S. Marine. Now, how did the Marines “sell” him on entering their branch of the service? I got to watch the process up close and personal. And let there be no doubt – presenting an elite challenge is a strong message, especially to a young man. For a certain slice of the population, striving to be the “cream of the crop” is an almost irresistible goal. The top. The elite. The first. The few. The proud. Of course, there are risks and dangers in the military, just as there are in any drive here in the battlefields highways of New Jersey. But there are no ads during football games in the fall extolling the elite status of urban commuters. I don’t see young men hungering to prove themselves as just one of many in a faceless crowd. Some people are driven to reach the top, and…putting on my marketing hat now…those may be the customers you should be pursuing most vigorously. If you have something elite to offer. 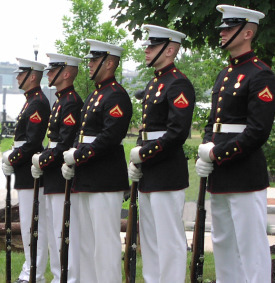 The Marines look for the ones with that glint in their eye, the ones who want to be the cream of the crop. Do you? Do your customers see themselves as the few, the proud? Or, perhaps even more importantly, do your employees? Some people just want everything easy. Others want to excel. They’ll tend to be the faithful ones. 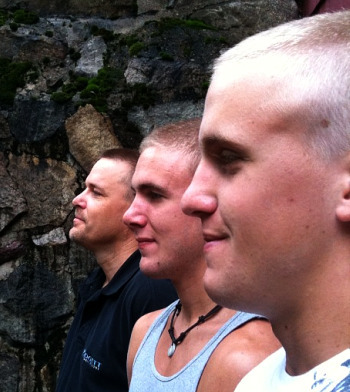 The Marine recruit, lined up with brother and Dad sporting “solidarity” military haircuts! As part of a major household digital upgrade late last year, we finally entered the 21st century and acquired a TiVo box. I love it – the user experience crosses the threshold of Easy, and we record a whole variety of programs that we can pull up when it’s convenient for us. 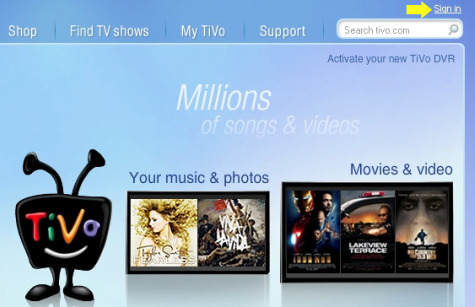 One thing bothered me, however, on the TiVo.com site – there was no immediate option on the home page for TiVo users to login (you can select programs you want to record right from the website, which is a great feature). An immediately visible home page login link, to me, was a no-brainer – users of the service should not need to go one level deep before being presented with that option. Netflix, Amazon – all the cool kids do it that way. Yes, it’s a “mixed” destination (for users and for potential customers who are investigating the service), but it seemed like a design flaw to me, because users who are scheduling recordings should be the biggest source of traffic. So I did what many of us increasingly do – just threw it out there on Twitter. And I was surprised to get a rapid response from a TiVo customer service person (that would be you, Shanan) on Twitter who agreed with the input, and passed it along to the development team. And there it sat, for months. Now I know a bit about web development, and while it may seem like a simple thing to move a link, when you’re dealing with a highly visible and functional site, you don’t make interface changes quickly. A month or two back, I was assured that the input wasn’t forgotten. It’s a subtle change, and many might not even notice it. But I, for one, appreciate it. And more than that, I appreciate the fact that TiVo was monitoring Twitter, responded promptly and enthusiastically, and eventually came through with a small but important fix. Customer service lesson: Listen, respond, act. Bread-and-butter basics, I know. But even though it took a while to see this change, I have nothing but praise for the TiVo team for making it happen. Which I don’t mind sharing publicly here! I’d heard good things over the months about Netflix’s unique corporate culture, so my curiosity was piqued when someone linked to a Slideshare about it. I clicked on over. Seeing that it was 128 slides, my interest in delving further wavered. I have a philosophical bias against mega-slide presentations! However, I started anyway, and soon found myself going through the entire thing. The idealist in me was astonished – here was a company actually adhering to (not just mouthing) many tremendous business principles that are the ingredients for long-term success. Count me impressed. Here’s the bottom line: Netflix is determined to have only dedicated and talented employees. No drones. Many companies tolerate sub-par performers as long as they don’t mess up too badly. In this way, companies end up with lots of deadwood – drones who muddle their way onward and upward, and serve as a source of discouragement and irritation for hard-working and creative employees who really want to make a difference. Is your company a No Drone Zone? Can it become one? 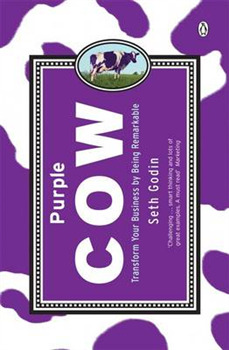 I wholeheartedly subscribe to the idea that businesses should strive to be remarkable – we should strive to be, in the classic words of Seth Godin, a Purple Cow in the midst of a herd of sameness. But many companies drift along with some level of success even though, perhaps, they aren’t all that remarkable. Why? One reason is the power of inertia. That is, we’ll often stick with a brand or company or service provider because they haven’t done anything bad enough to lose our business. I am driving my third Mazda. My first, an older 323, was a pretty good car. Later, I bought a Mazda 626, which I had for a good number of years – and I was pretty pleased with it. It wasn’t spectacular, but it was perfectly adequate and reliable. And when it was time to get a new car for my business a couple years back, the winner was…a Mazda6. I’d gotten used to the Mazda. I liked it. It was perfectly OK. Surely there were other cars that would have been perfectly OK as well. But, you see, they were unknowns to me. I had a baseline level of trust in Mazda, and inertia argued that there was no compelling reason to change. For the same reason, I’ve had a string of Dell computers. Again, none of them give me the same pride of ownership as when I whip out my iPhone, but they have worked reliably for me. Why change? (well, actually, I do plan to convert the family computer to a Mac – but that’s because of a desire for a whole new platform, not because of dissatisfaction with Dell). Inertia. If it’s been OK, or pretty good, or really good in the past, it helps ease us into giving repeat business. I would hope that no company will strive to live off of this reality. “Our mission – to be quite adequate!” But perhaps it explains why so many companies survive and even thrive (for a season) in the marketplace. Bleeding edge folks tend to be more daring in their purchases of the latest and greatest, less focused on straight-on reliability and adequacy. But there is a vast pool of consumers that buy on inertia. If you’re not going to be a purple cow, at least be a really good black and white one. But I still think you should strive to be purple. What do you think? Can black & white cows still make it in the marketplace? And, how does inertia shape some of your decisions? Today, I did two things that I’d been putting off. 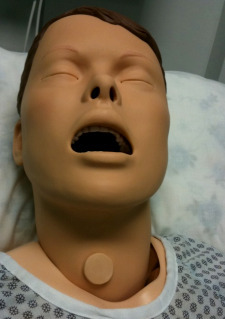 However, good marketing – effective calls to action – put me over the edge in each case. 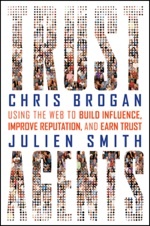 I’ve been intrigued by the new book just released by Chris Brogan and Julien Smith called “Trust Agents” – I figured, in the murky intentions of my mind, that I would buy it eventually. But then Chris put out this blog post, and it was the motivation I needed to finally take action. Why? Because it was Chris, and it was important to him, and I knew I wanted that book anyway (plus, it gave the the ‘Amazon Free Shipping’ excuse to make the long-overdue purchase of a David Meerman Scott book I’d been putting off). If you want to order a copy, here’s the place to go. I also made a LONG-overdue visit to the dentist, where I endured gentle ribbing for my neglect of office-visit dental hygiene. 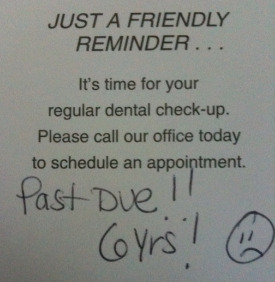 Now I have very good teeth, and in fact there were no cavities (though a thorough cleaning was definitely in order) – but what motivated me to take action was the little personalization on the reminder postcard. I was successfully able to deflect all the other ones over the years, but his one both amused and shamed me, as it was intended to, so I finally made the appointment. Which makes me wonder – what little tactics do you employ (or should you try!) to get people over the edge, and give them a reason to do what they know they ought/want to do? What are the most effective calls to action you’ve seen? Please share in the comments! The very thorny problem of Social Media ROI (Return on Investment) was finally solved this week by the brilliant research work of social media guru Olivier Blanchard (aka The BrandBuilder). Olivier, well-known throughout the blogging world as a marketing finance expert and bike-rider, dug deep into the world of virtual metrics and came up with a reliable, scalable, and reproducible method of calculating the financial impact of social media. 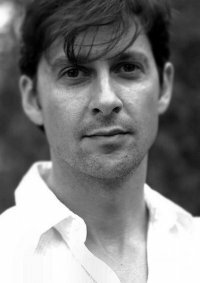 Eschewing traditional measures such as dollars invested vs. dollars realized, increased sales, and boring data points like that, Olivier applied his guru-like creative expertise to come up with a totally new and relevant series of measures – the “Blanchard Scale” (BS). Since social media is relatively new and there is so much indirect impact on business, the Blanchard Scale bypasses hard numbers for new measures that take into account the subjectivity and wishful thinking of social networking efforts. – The Chihuahua (CH) – the smallest measure, a chihuahua of social media impact means that somebody saw something you did somewhere. If you get re-tweeted on Twitter, that’s an extra (or, venti) chihuahua. – The Nutella (NU) – a Nutella of social media impact is when at least one comment on a blog or one Twitter dialogue ensues. A Nutella unit is often considered a measure of social media “sweetness”. If the dialogue is re-tweeted on Twitter, that’s a NU-CH. – The Blanchard (BL) – also called a “glop”, this is a totally subjective impact measure which indicates that a bunch of really cool stuff is going on over several platforms, even if we can’t quantify it. 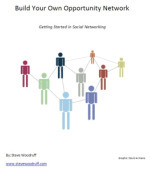 Most social media campaigns are considered a success at a 5-Blanchard level post-launch. – The Brogan (BR) – formerly labeled the Godin, this rarefied measure of impact is only achieved when you go viral, which means that there must be some money changing hands somewhere, and probably we’re going to get some. A 3-Brogan campaign is the gold standard in social media ROI. Occasionally augmented by a Vayner, which currently hasn’t been fully defined, but is definitely kinda loud. 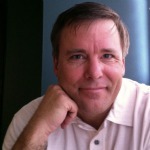 – The Kaw (GUY) – only achieved once so far, all top bloggers want to be “that Guy”. Guess what – you’re not. Doing BS calculations can begin immediately after downloading the Blanchard Scale from the BrandBuilderROI website. You simply make up your own price and get right to work, which is good practice for utilization of the tool. Those who use the Scale for a week receive a free “I’m a Full-of-BS Social Media Guru” certificate, suitable for scanning and posting on a blog sidebar. Apart from a 975-work blog post on the subject, Olivier was reticent to share much about his next endeavor, the Nutella Channel, created to spread recipes using the new blanchard cooking scale. It is rumored, however, that a new micro-measure, the “Gill“, will be introduced when the upcoming Book of Blanchard and new on-line video channel are unveiled.